It’s here! The announcement of the latest theme for Hay Hay It’s Donna Day. See…the great thing about being able to host HHDD is that you can pick a really challenging theme…and it’s okay because you can’t win! I’m kidding – mostly. The theme for this round of HHDD is terrines. This is a theme that I have been wanting to do for some time…and now have the opportunity to give them a go. There are a few types and definitions of terrines. For the purpose of this challenge, we are using the word terrine to mean prepared or made in a terrine or loaf-shaped pan. Often, terrines have layers throughout them that, when sliced, create a beautiful look for the dish. There are 222 results for "terrines" here at Food Down Under! As usual, Flickr is a brilliant source of photo inspiration. When I searched for "terrine", I got close to 2,000 results. Here are stunning examples of a sweet and a savory terrine. Do your own search and see all of the drool-worthy images. The Mahalo post about terrines has lots of interesting links to the history of terrines, as well as terrine recipes out there in blog world. The best mainstream source for recipes would be Epicurious.com – 47 results and several photos. The theme for HHDD is terrines. The only rule is that your terrine must be rectangular or loaf shaped. That will even the playing field and let the intricacies of the terrines shine through. You may make a sweet or savory terrine. Colors, multiple ingredients and layers are encouraged but not required! You do not have to use a Donna Hay recipe. Any recipe or creation of your own works! The deadline to submit your entries is Saturday, November 10th. The round-up will be posted a week later on November 17th. Please email your HHDD submissions to runningwithtweezers@gmail.com. In your email, please include the following information: your blog name, your name, your location, your recipe name, and the permalink to your entry. The winner will receive a food-related prize worthy of being given to the person who conquers this challenge! Good luck! The recipe for my terrine comes from Donna Hay’s Modern Classics 2: Peach and Vanilla Panna Cotta, which is on page 106! – Place the water and sugar in a saucepan over medium heat and stir until the sugar is dissolved. Add the peaches and allow to simmer for 3-5 minutes or until soft. Remove the peaches (reserving the cooking liquid), slip off the skins, and set the fruit aside. – Place 1/4 of the peach liquid in a bowl, sprinkle over the gelatin and set aside for 5 minutes. Add the gelatin mixture to the remaining liquid in the saucepan, stir through and simmer for 2 minutes or until dissolved. – Place peach halves, cut-side up, in a well-greased loaf tin and pour over the liquid. Refrigerate for 2 hours or until firm. 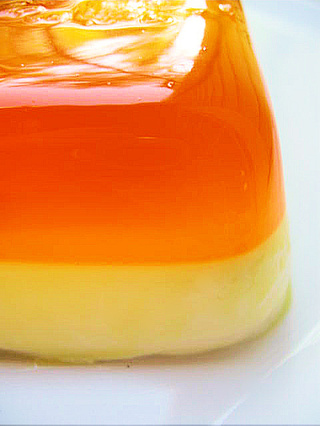 – To make the panna cotta, sprinkle the gelatin over the water and set aside for 5 minutes. Place the cream, icing sugar and vanilla in a saucepan over medium heat and stir. Add the gelatin mixture and simmer over low heat for 4 minutes or until dissolved. Allow to cool to room temperature then pour the mixture over the set jelly and refrigerate for 6 hours to overnight. To serve, dip the tin into a baking dish of warm water and invert onto a plate. Slice and serve immediately. Sounds wonderful Tami. Would you mind posting the recipe for those of us who don’t have the Donna Hay magazine. Thanks. This one sounds difficult …. I am not a terrine man, but I will see if I manage to do one in my little time!! Last time I made a terrine I used a toy tool box lined with plastic wrap. Maybe I should get a real mold this time? does it have to be a donna hay recipe? This will be a first for me…Can’t wait! No…only *my* post has to come from a Donna Hay recipe. Yours can be a recipe from anywhere…or something you make up yourself. 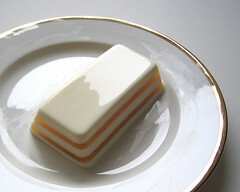 Can I use a previous post on a terrine I made a few months ago? Thanks. Great choice of topic! Oooh! I have never made one of these but I’d love to try! :) Great theme! Tami, what a wonderful post, full of great ideas and resources! Interestingly, with my admittedly limited exposure to terrines, I’ve only thought of the paté types in the past. You’ve opened up a whole new world here! I’ve only made a terrine once and it was a very long time ago…Hmmm…might be an excuse to purchase one of those cute littler terrines!